First decent pic (of me) taken with a Welta Reflekta that I picked up for £15 on ebay – perhaps because it wasn’t my finger on the shutter release. 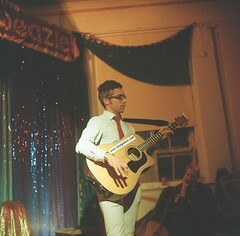 It was taken at the Catweazle club, Oxford, about a month ago (it can take time to get films developed). I’m finding it hard to identify and date my particular model Reflekta (earlier versions were called the Reflecta). None of the photos I can find on the internet look quite like it. You are currently browsing the archives for the Welta Reflekta category.